Protecting yourself from fire is essential! Unfortunately, fires break out in commercial buildings regularly. In fact, most of these fires are a result of human error and in most cases can be prevented. 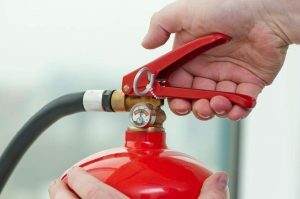 As a result, having the proper fire protection system in place can really do wonders towards safety and protection of all occupants and the building itself. Here are some common ways a commercial fire can begin. These days, businesses come equipped with a myriad of technologies that they exclusively rely upon just to function properly. In fact, with these technological advances and tools, come a wide array of cables and wires. As a result, if these wires are improperly positioned or maintained, they can end up becoming huge fire hazards. Therefore, every business owner or building manager should seek the assistance of a professional to ensure that all cables and wires are firmly maintained on a regular basis. In the end, all it takes is a tiny fraying of wire to cause a massive fire to break out. Kitchen fires are an all too common occurrence in commercial facilities. In fact, these types of fires typically begin because of some human error. As a result, forgetting to turn off equipment or leaving the burning stove unattended can lead to disastrous results. Therefore, properly training kitchen staff on how to use all the equipment in the kitchen is a necessary step to avoid losing your business to a kitchen fire. When it comes to heating a commercial building, the heaters, boilers, and furnaces should never go ignored. In fact, these heat sources require routine maintenance to ensure that they are working properly and are not a fire hazard. As a result, business owners need to seek the assistance of a professional who can regularly and appropriately maintain the heating sources within their facility to ensure that everything is working properly. This entry was posted on Thursday, September 14th, 2017 at 12:16 pm. Both comments and pings are currently closed.